Photo: Kentucky coach Adolph Rupp. Photos below: Johnny Green celebrating with fans and the 1956-57 team photo. 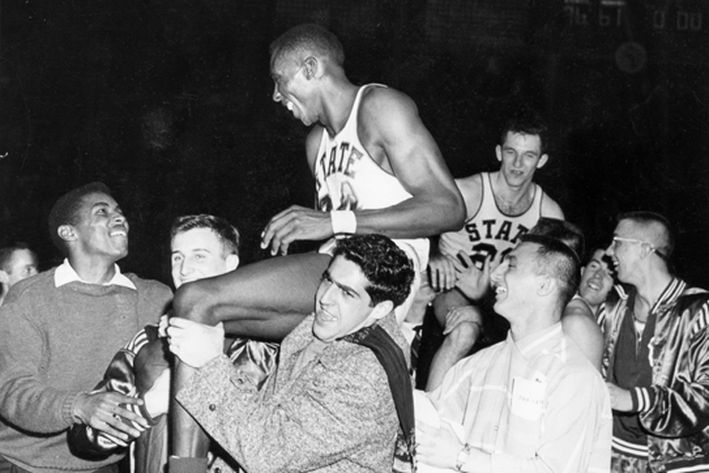 Michigan State’s Johnny Green brought out the best in just about everyone during the 1956-57 basketball season. Upon joining a 4-7 lineup in January, he sparked a 10-game winning streak that captured the Spartans’ first Big Ten hoop title. And “just about everyone” included Kentucky head coach Adolph Rupp, a man history has painted a racist while he ruled his segregated state. Michigan State and Kentucky met in the 1957 NCAA Mideast Regional on the Wildcats’ campus, forcing Green, an African-American, to endure the humiliation of Jim Crow laws. The No. 11-ranked Spartans played two games at 10,000-seat Memorial Coliseum, edging No. 17 Notre Dame in the semifinal 85-83 and upsetting No. 3 Kentucky in the final 80-68 to book school’s first Final Four trip. Green was the only black man for either team on the court. Same with after the title game when the finalists gathered in an arena room for sandwiches. But Rupp didn’t avoid Green. In fact, he sought out Green. It’s startling to learn Rupp’s words all these years later with the context of history, although easy to understand why he was impressed. “Jumping Johnny” totaled 20 points with 27 rebounds in the semi and the 6-foot-5 sophomore added 14 points with 20 boards in the regional championship. Other than Jim Crow, who wouldn’t want Green on his team with the ridiculous numbers he put on those back-to-back nights? Well, Rupp waited until 1969 to sign his first black player. Freshmen were ineligible in those days, so Tom Payne made his varsity debut in Kentucky blue in the 1970-71 season – more than a decade after Rupp claimed to covet a player like Green. But that 1957 night pre-dated Rupp’s widely viewed reputation as a racist. At the time, Rupp was simply known as the “Baron of the Bluegrass” with three NCAA titles and a fourth the next season in 1958. Also, he was “The Man in the Brown Suit” since he considered wearing a brown suit lucky. What Rupp established from 1930 to retirement in 1972 is the reason Kentucky basketball has remained nationally elite for generations while Wildcats football can’t climb out of the bottom of the Southeastern Conference. Rupp, who died at age 76 in 1977, retired with a then-NCAA career record for victories of 876 that stood as a hallowed mark for 25 years until North Carolina's Dean Smith (879) broke it in 1997. It was only another 11 years until Bob Knight (Army, Indiana and Texas Tech) passed Smith’s mark in 2008 and another three years before current record-holder Mike Krzyzewski (Army an Duke) surpassed Knight in 2011. Rupp’s identity as a winner overshadowed segregation because in his time the media avoided writing about black-white issues. That’s what makes Green’s story of the night he met a gracious Rupp in March 1957 so interesting. Right or wrong, the moment that ingrained Rupp’s perception as a racist was the 1966 NCAA championship game when Kentucky’s all-white team was upset by five black starters at Texas Western (now UTEP). History considers it a milestone in the game’s evolution, but it wasn’t marked as such in the moment. Frank Deford, the legendary “Sports Illustrated” writer and 2012 Red Smith Award recipient, covered the 1966 Final Four and made no mention of the black-white issue in his magazine piece. But with the passage of time the black starters vs. white starters matchup took on a life of its own, including a Disney movie, “Glory Road,” in 2006. In 1991, Deford was quoted in a Lexington Herald-Leader story saying too much has been made of the game in media accounts decades later. To that point, Loyola of Chicago’s four black starters won the 1963 NCAA title, defeating all-white Mississippi State along the way. In 1964, UCLA’s three black stars defeated all-white Duke in the final. In the 1965 championship game, UCLA with three black starters defeated Michigan with three black starters. The black athlete had arrived by 1966. Kentucky-Texas Western was the next chapter in the game’s evolution, but the 1966 final has the disconcertingly convenient hook of five blacks vs. five whites. Nevertheless, Rupp’s racist legacy has been an albatross for any future success enjoyed by Kentucky’s modern-day predominantly black teams. Every year that Kentucky is a contender for the NCAA national title – once again this season -- Rupp’s racist reputation bubbles to the surface. The various portrayals lack sympathetic reviews of Rupp; the Kentucky racist label has outweighed the Baron of the Bluegrass. It’s worth noting, though, that Rupp, the preeminent basketball coach of his time, integrated his segregated state program one year ahead of Alabama's Bear Bryant, the preeminent football coach of his time. Bryant, though, has largely received a pass for dragging his feet on integration in the same time frame as Rupp. But despite Green’s success and Rupp’s compliment, that regional weekend and one other visit to the South included painful memories that are still with the 81-year-old Green, a Michigan State Hall of Famer and 14-year NBA veteran who makes his home in Dix Hills, N.Y. Green's teammate Pat Wilson, who also played for the Spartans in the 1955 Rose Bowl, said he remembered the Green's treatment as a second-class citizen and that the Spartans were unable to stay in a local hotel due to Jim Crow laws. Green’s other trip below the Mason-Dixon Line was the Dixie Classic at North Carolina State during the 1959 Christmas break. Michigan State and Cincinnati, featuring Oscar Robertson, were denied the luxury of staying at downtown Raleigh’s segregated Sir Walter Raleigh Hotel, one of the benefits to enjoy for the participating all-white teams. They also endured racial taunts from fans and cheap shots from players in the games at Reynolds Coliseum on N.C. State's campus. Michigan State and Cincinnati had to stay in a campus fraternity vacated for the holidays. Green felt helpless guilt that his white teammates were denied special accommodations at hotels and restaurants.